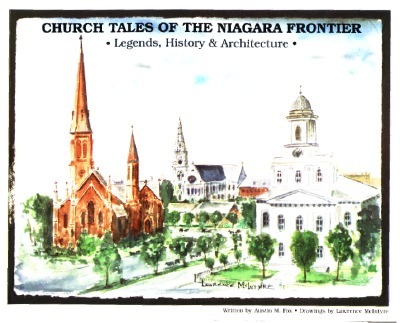 This first-of-a-kind book traces the rich history and folklore of the Niagara Frontier through brief intriguing accounts of more than 60 area churches and places of worship. Architectural historian Austin Fox compiles memorable stories of sacred sites, from magnificent urban cathedrals to the quaint village churches that many of our parents and grandparents may have attended. Church Tales includes 125 vivid photographs and renderings. The detailed pen-and-ink drawings were created by respected artist Lawrence McIntyre. The volume is both attractive and user-friendly, with graphic design services supplied by Melissa McIntyre Daily. "The first steamboat on the Great Lakes, the Walk-on-the-Water, sank in a sudden gale just outside Buffalo Harbor on October 31, 1921 ... One of the survivors was James Clark of Lancaster. Afterwards, Clark salvaged some of the timbers from Walk-on-the-Water, and they were used in the construction of the Lancaster Presbyterian Church." The 128-page softcover book includes a comprehensive index for the armchair researcher. It also includes special sections on the old churches of downtown Buffalo and church organs. The places of worship are located in more than 30 cities, towns and villages across Western New York and Southern Ontario.